This post is the fourth and final installment in a series. Read the first here: Ruminants on the Range. The second here: The Bedrock Mortars of Selby Rocks. And the third here: The Pictographs of Painted Rock. Every crunchy footfall explodes in a white cloud of salt, as I pick my way through the maze of tributaries that vein the grassland around the fringes of Soda Lake. I wander by scattered pieces of old sun-bleached, salt-crusted lumber along with several coils of rusty barbed wire. 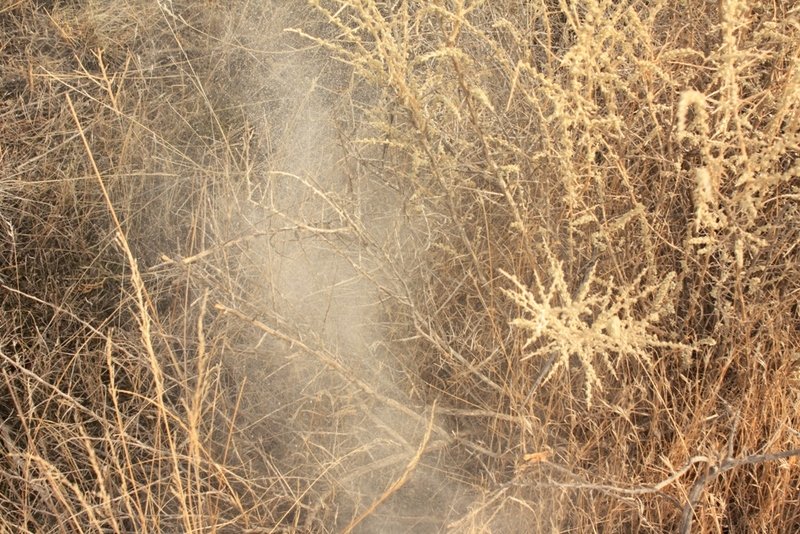 Walking across the crispy grassland surrounding the shoreline, I step into a dry channel to cross and my foot falls silently into several inches of super fine, fluffy dust that feels like powdered graphite beneath my feet. It makes me think of walking on the moon. 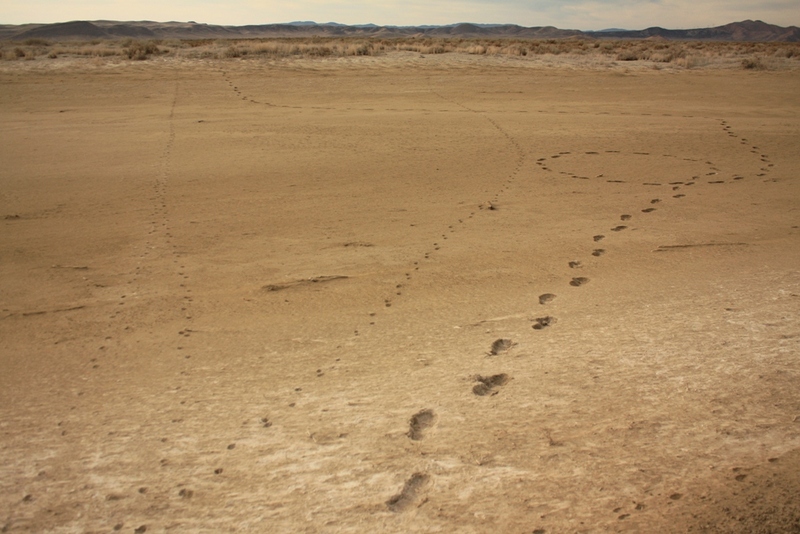 The branch channel, which drains into a smaller basin adjacent to the main body of Soda Lake, has a dirt bottom rather than the hard crusty saltpan typical of the larger ponds. 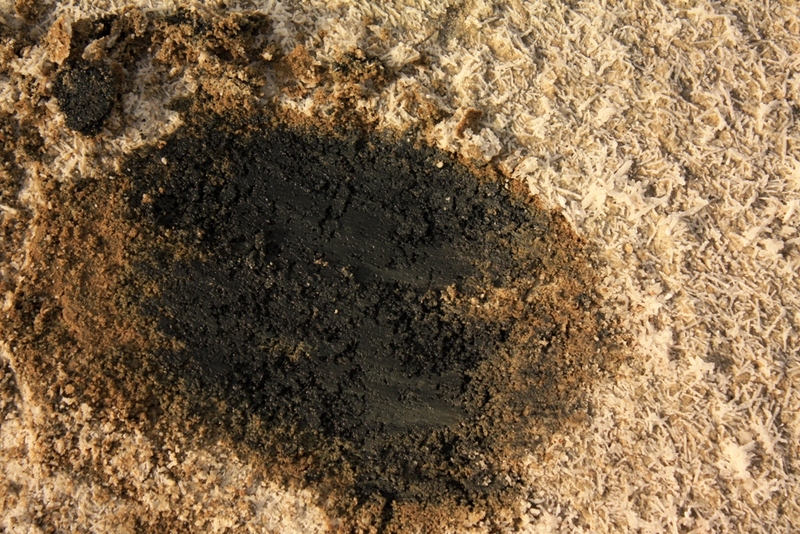 Small animals have pounded narrow, hardened trails into the deep powdery silt in various places and occasional hoof prints mar the otherwise smooth textured duff. I pause to consider a series of tracks wondering if they were left by deer or antelope. They are too small for tule elk. Turning slowly about in a full circle I see no signs of any animals but their footprints and no trace of civilization. A quiet stillness blankets the desolate land. Every footfall explodes in a puff of white salty dust. Much of the Soda Lake complex of channels and basins is hidden from sight. It sits below the level of the plain and is thus invisible from afar. It is much larger than I had previously thought. When wandering around the area I cross numerous channels leading toward the lake, which materialize in the ground suddenly and for seemingly no reason. 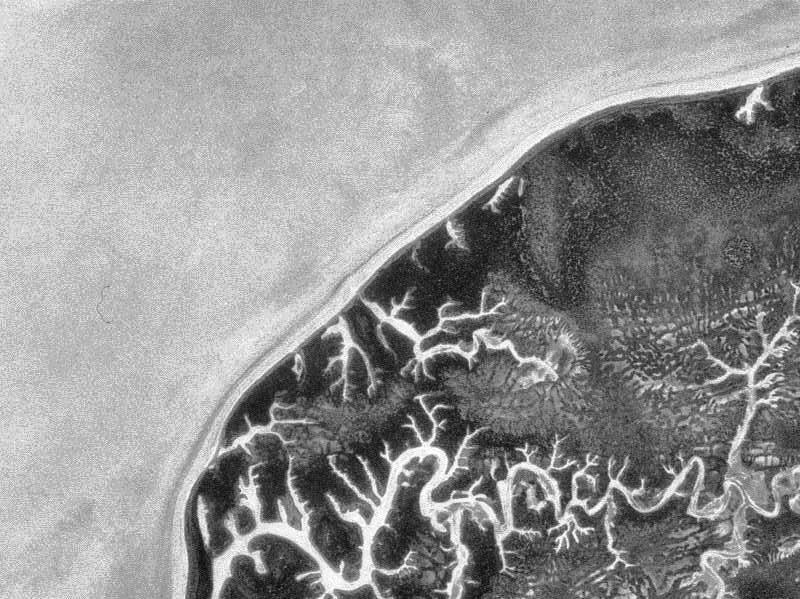 The barren ditches point like crooked arthritic fingers into the flatness of the grassy plain, depressions created through saturation of the lowlands and the resulting slight flow of water down an imperceptible slope. I come to one dry dirt-bottomed basin with three sets of animals tracks crossing it. Two of the tracks join together on my left and cross the lakebed in a single straight line, while a third set drifts at an angle rightward before making a beeline to the far side. Finding a bit of humor in the animal sign, I mockingly leave my own tracks. Long before reaching the edge of Soda Lake I see it is dry or at least not full of water. 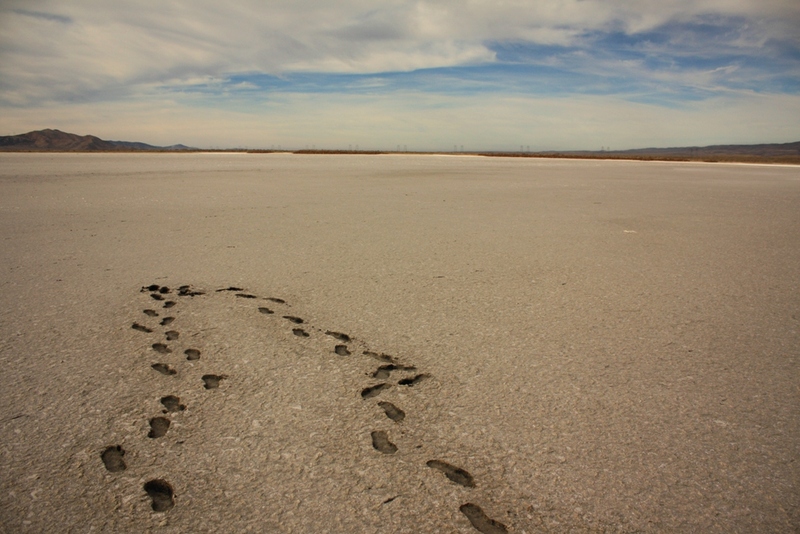 The lakebed along the shoreline is covered in a ceramic-like layer of saltpan, but gives slightly under foot. The farther I walk toward the center of the lake, the less developed the salt crystals, the thinner the layer of saltpan and the softer the soil. Until it no longer holds my weight and I begin sinking into the mire. A gooey black sludge reeking of decomposed organic matter makes up the lake bottom. Were it not for the salt it would make an incredible compost for gardening. Atop the black sludge is a thin layer of brown soil that is, apparently, the result of wind blown debris accumulating in the basin. The saltpan forms on top of the layer of soil as the water evaporates. Retracing my footprints back through the complex of alkali flats as the sun drops close to the horizon, the temperature falls noticeably and the land feels even more lonely. I feel like a lone hominid in a primordial age wandering the shore of a prehistoric sea. I take comfort in the bleak isolation. Walking into the short grass of the plain a bit away from the salt flats, I lay on my back with eyes shut and attempt to sense without sight my surroundings. It is an exercise that provides a different sense of reality compared to what I have encountered through out the afternoon with eyes leading my way and, for the most part, dictating the terms of my experience. 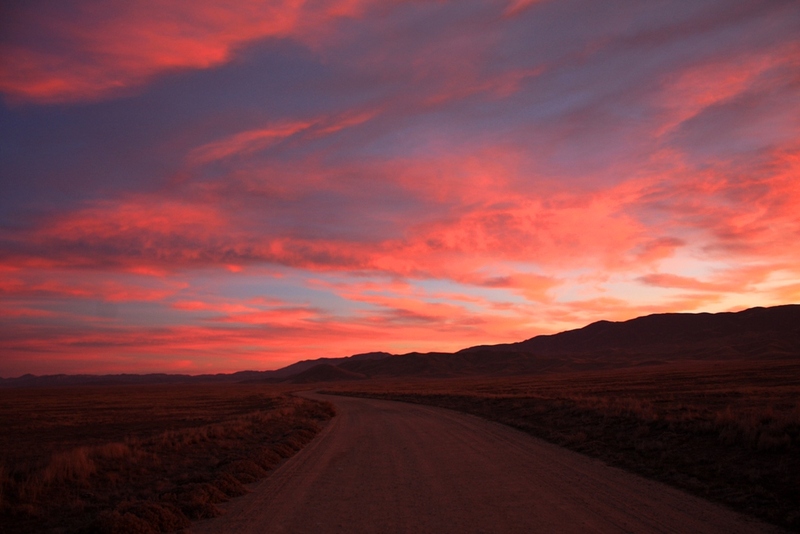 I drive down the dirt lane of Soda Lake Road peering through the mottle of dust, dried dog slobber and nose prints covering the windows of my vehicle. The time is right for spotting grazing antelope, deer or elk, but scanning the vast plain there are none to be seen. Sensing that it’s time get moving on home I increase my speed down the dusty road. The clouds reflect the last vestiges of solar radiance and burn brightly in the darkening sky, as if to bid a warm farewell as I head toward the long winding mountain road home. This entry was posted in San Luis Obispo County and tagged backcountry, Carrizo, Hikes, Hiking, Hiking (2), Landscape, National Monuments, Nature, Photos, Pics, Salt Flats, Soda Lake, Sunsets, Wilderness, Writing. Bookmark the permalink. Great story! I enjoyed reading about your journey. It reminds me of a similar place in Oregon called the Alvord Desert. Places like these really can give you a since of total freedom. Exactly. That is one of the main reasons I am so drawn to the desolate hinterlands.